A girl who thought chicken only came in the way of nice little packages without bones or skin. It’s amazing how a little knowledge can really change a person! Once I started to include nourishing grass fed meats in our diet, I found it was cheaper (and sometimes the only thing available from local farms) — the whole chicken. Bones and skin, oh my! At $4.25/lb on average for a 4-5lb whole chicken, I felt I really needed to use every ounce of chicken I bought, out of respect for the animal and my budget. I quickly discovered the joys of making my own golden homemade chicken broth packed full of vital nutrients. 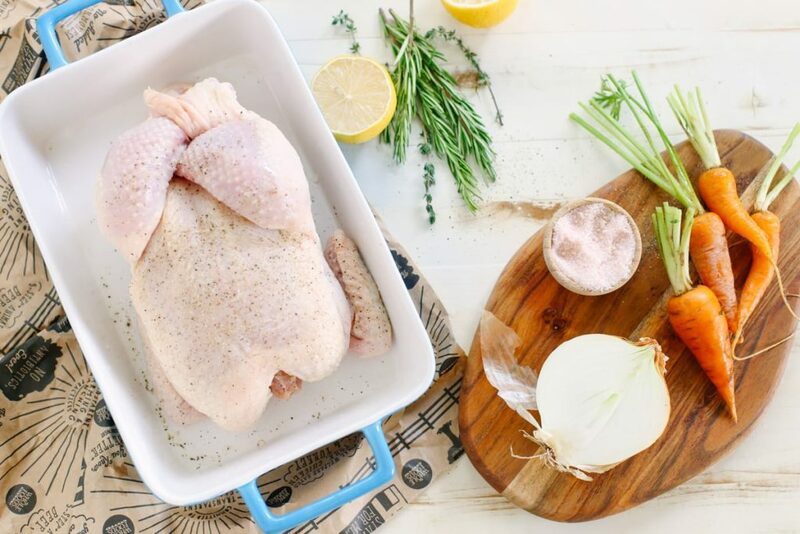 Now, it’s easy to pick up a carton of broth at the store, however, there is a huge difference between that box of Swanson Broth and fresh homemade broth made from pastured chicken bones and veggies. If you look at a box of chicken broth from the store you are going to find a lot of ingredients that are plain ol’ FAKE. 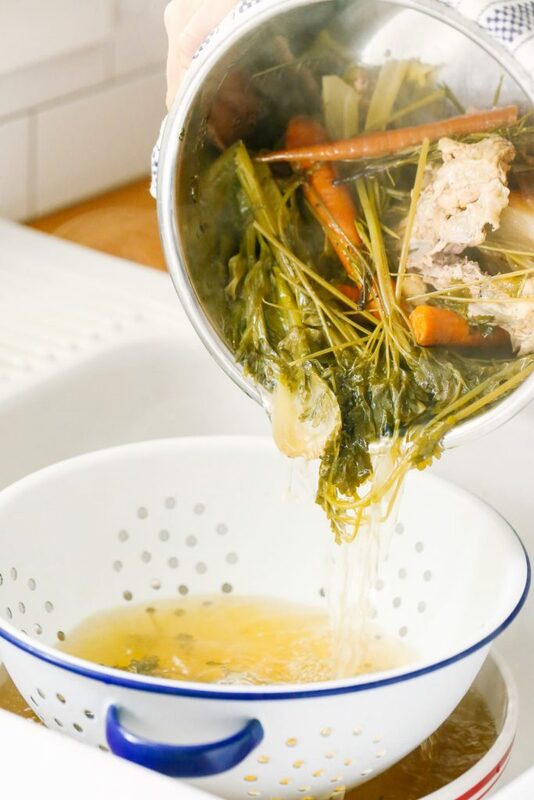 Additives that extend the life and flavor of broth, stripped of all nutrients. Homemade chicken broth is traditional, having been been prepared for generations! Boosts your immune system. Ever wonder why chicken noodle soup is recommended when you are sick? Rich in glycine, an essential amino acid for our bodies. The Paleo Mom has an awesome post about the great benefits of glycine and proline, two very important amino acids found in homemade broth. Rich in collagen. Looking for healthy hair, skin, and nails? Skip the Botox and drink the broth. Homemade broth is such a rich source of nutrients and super inexpensive to make. It’s perfect for stocking your freezer with and including in your family’s meals. I use our homemade broth in soups, cooking rice, steaming and roasting veggies, mashed potatoes, and any kind of gravy. Because I am a busy mom, I need to be able to make broth without spending a lot of time in the kitchen, so I choose to make mine in the crock-pot. 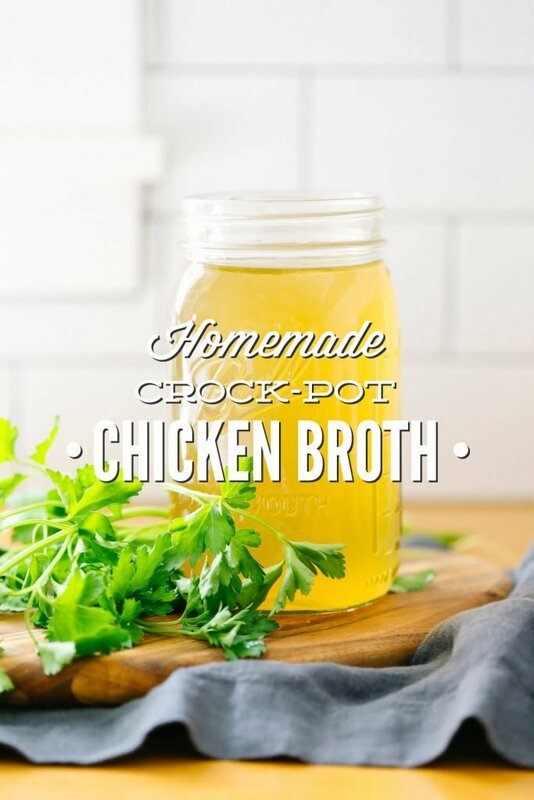 This works well for me since I can just transfer the leftover chicken bones from our dinner to my crock pot and leave it on all night, waking up to the wonderful smell of homemade chicken broth! veggies and herbs 1 onion, 2 large carrots, a few sprigs of parsley, 2 stalks of celery, No need to chop the veggies into small pieces. Just cut the veggies in half. Place the chicken bones in the crock-pot (I use this one). Top with veggies and herbs. Add salt and peppercorns, if using. Fill the crock pot with water, leaving a little space at the top. Cook for 10 hours on low heat. Allow the broth to cool. Place a large colander (like this) inside a large bowl. Pour the broth into the colander, to separate the bones and veggies from the liquid. You will now have your bones and veggies in the colander, the bones may be used to make another batch of broth. The veggies need to be tossed. Rich golden broth awaits in the bottom bowl. The broth should be used within a week (kept in the fridge) or frozen for up to 6 months. 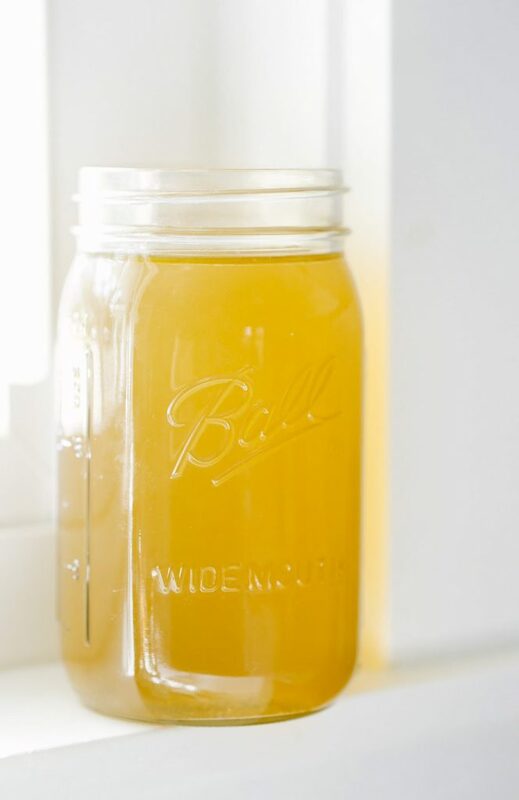 Learn more about freezing broth. 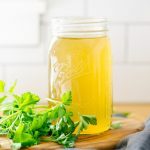 I have read on some other sites about making chicken broth, the benefits of adding a tablespoon of vinegar which helps draw out more nutrients from the bones. I have read the various views on the subject as well. I do not use Apple Cider Vinegar and have no problem getting lots of excellent broth from the bones. We use ACV for soaking grains and oats as an acidic medium. Mason jars freeze okay? I have not tried that and was just curious …..
yes, as long as you use wide mouth jars, allow the liquid to fully cool before placing in the freezer, and leave room for expansion at the top. I freeze broth weekly in my jars. Hi, I just love your blog! I tried the waffles and they were delicious! I have a question about the broth. Are the leftover bones raw or cooked? thank you! Thank you so much, Anca! I am so happy to hear that. You can use raw or cooked bones, both will work great. Hi Kristin! I’ve been saving chicken broth any time I cook a whole chicken in my crockpot. You mentioned that the bones can be used to make more broth? After I cook a whole chicken in the crockpot, I can use the skin and bones to make another batch of broth. Could I use the bones to make a batch after that, too? In the end, it would be about 3 batches of broth. Would chicken bones extract enough nutrients and flavor for three batches? Thanks! Hi Christin, The bones can be cooked twice for broth. Make your first batch of broth. Then, toss the veggies, place the bones back in the crockpot with new water and let them simmer with new veggies for another 10-12 hours. You will know all the nourishment has been stripped of the bones when they are no longer hard, but rather soft and flimsy. Wonderful. Thank you so much for the clarification! When making chicken broth from the bones, do you use any of the broth left from cooking the whole chicken? Or do you just add water? Hey Susan, I usually don’t use the leftover water, but you definitely can! My broth turned into jello overnight in the fridge. Did I not use enough water? Hey Sarah, Congrats!! Your broth gelled. That’s exactly what you want to happen when it’s refrigerated. That means it’s full of nourishing goodness. To get it back to a liquid state, just warm in saucepan, the dreaded microwave ;), or leave on the counter for a couple hours. It will return back to a liquid state. Oh… Awesome!! Thanks for the quick response. I was waiting to get an email to tell me you replied, but decided just to check back. Glad I did! I tried to make broth after making the whole chicken fajitas in the crock pot, but the broth had a burnt smell to it. I put the skin, bones and veggies in with 6(ish) cups of water. Any thoughts as to what I might have done wrong? Hey Jessica, I think the smell may be coming from the spices and soy sauce used to make the fajitas. I would recommend washing off the “sauce” before using the bones for broth. If you still have the bones you can remove them from the broth, wash them off and reuse them to make another batch of broth. Hope that helps. I just wanted to make sure, you use the bones from one chicken for the recipe? Hey Debbie, Yes, you’re correct. I use the bones from one whole chicken to make broth. For a richer broth, cook the bones on high for 12 hours or on low for 24 hours, when using the bones from one chicken. You’ll know the bones have been stripped of all nutrients when they are flexible or easily break. Ive made broth before in my crockpot, but it always turns out so oily and it grosses me out. My broth doesnt look yummy like yours does. It loom heavy and oily. Rebecca, If the broth is too oily, you can strain the broth and then let the broth sit in the fridge (in a large bowl) for 24 hours. The fat will rise to the top and harden. You can then restrain the broth and remove the hard fat and place it in desired containers. I havent tried refrigerating it for that long. Thank you for the suggestion and for responding so quickly! You’re welcome, Rebecca. I learned that little trick by accident, but it seems to work very well. Can I freeze chicken bones until I have enough to make a batch of broth? Yes, you can. I freeze vegetable scraps in one bag and bones in another. I combine the two bags in my crockpot with water to make broth. Hey Kristin! I just tried making your chicken broth for the first time. I used the bones (but forgot to include the skin) of a 4lb chicken plus the other listed ingredients. I filled the crockpot which took about 12 cups of water. The result was very watery. Did I put too much water? Is the lack of skin making that big of a difference? I really appreciate your help and I LOVE your blog! Hey Meredith, The skin does help gel the broth. If you still have the broth and bones available, I’d just cook them for another 6-8 hours in the crock-pot. This should help with the consistency. PS: Thank you so much. I’m so glad you enjoy the blog! I love this community and the opportunity to share here at Live Simply. Thanks, Kristin! I’ll give that a shot. You’re welcome! Let me know how it goes. Hubby gave me a pressure canner for xmas a few years back. Being Cajun I have a 10 gal pot for my Rabbit & Venison Andouille sausage Gumbo. I save EVERYTHING from veggies; peelings from carrots, skins (sans black spotty ones) from onions, stems from mushrooms, ends of garlic, peels from zucchini/squash/etc, tops and bottoms of celery, fennel (A MUST) bulbs cut into quarters, you get the picture…. They ALL go into ziploc freezer bags. I get rotisserie chicken bones from a the local whole foods and then I dump ALL into a pot with filtered water. Add peppercorn, Himalayan Pink Sea Salt, bay, several sprigs of thyme and tumeric (cancer fighter). Cook for 3-4 days on low heat, then drain into unbleached coffee filtered strainers. I pressure can about 14 quarts and 17 pints of chicken stock. Save room in freezer for individual baggies of smoothie ingredients which you MUST add bitter melon to!! Great ideas, atasteofcreole! Thank you for sharing. How do you get the rotisserie bones from whole foods? Hey Susan, I’m not sure that I understand your question, so let me know if you need clarification of my answer. I roast a whole chicken, debone it, and use the bones to make the broth. Whole Foods also sells read-to-go rotisserie chickens that you can use to make broth (once it’s been deboned). Susan was asking for clarification on ATasteofCreole’s statement – “…I get rotisserie chicken bones from a the local whole foods…”. That statement makes it sound like this person is going to Whole Foods and actually getting leftover bones from them rather than using bones from a chicken that they purchased. Does Whole Foods hold on to bones and scraps and give them to customers if asked? Hey Brian, To my knowledge, Whole Foods does not hold on to bones and give them to customers. I really want to try this method for making broth! In the past when I have made it on the stove top, recipes will say to skim off the foam with a spoon. Do you need to do that with this method? Hey Sarah, I think stovetop broth is skimmed because it’s rapidly boiled or the broth uses a raw chicken, and both create foam. Crock-pot broth doesn’t need to be skimmed (no foam :)). Not silly at all, Em :). I had very similar questions when I first got started with making homemade broth. 1. If you’ve used spices (like paprika, chili powder, etc.) you may want to wash the cavity. 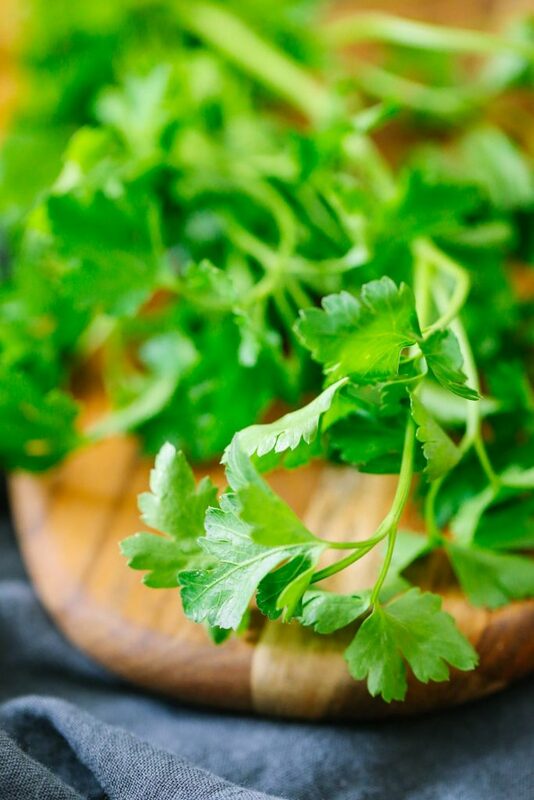 Strong spices will change the flavor of your broth and future foods. If you didn’t use strong spices (onions, garlic, salt and pepper are fine) then there’s no need to wash.
2. No need to break the bones. After cooking, the bones will probably be very tender–this is a sign that all the nutrients have been “sucked” out. I made broth once using the leftovers from a whole chicken, veggies and water. I got the recipe from Raising Generation Nourished. My question is, do you skim the fat off the top? I feel like my broth had a weird taste and was oily. I’m not sure if it is because I’m not used to homemade broth or if I did something wrong. Thanks! Hey Caitie, You can skim the fat from the top if the broth appears too oily. I usually leave the fat in the broth. Homemade broth is generally a bit more fatty than the store-bought version. Hey Denise, I’m so glad you’re enjoying the blog! The mason jars usually take about 24-48 hours to defrost in the fridge, depending on how cold your fridge is. I also use my microwave to defrost the chicken broth in the jars, or place the jars in warm water (not boiling) and let the jar defrost at room temperature in the water. I followed your whole chicken recipe and broth recipes, both turned out great. Just have a couple of questions about saving the bones for another batch. Should that be done right away? Can the bones be saved for a later date? If so, what is the best method of storage and for how long? Hey Molly, I’m so glad the chicken and broth turned out great! I recommend using the bones immediately to make another batch of broth, and then freezing the extra broth for later. This is my first time. How clean should the bones be? There’s a lot of meat I can’t get off the bones. Thanks! Hey Cathy, They can still have meat on them. I would pick off as much meat as you’d like to keep, and then use the remaining meat and bones. Does the chicken bones/skin come from chicken already eaten at meals? Do you just have your family leave them on their plates and save them for the broth? Just trying to see how to go about this. Hey Ro, Yep, that’s exactly what I do, or I remove the skin and bones before serving the chicken on the table (if I’m serving a whole chicken). Do you ever do anything with the giblets of the chicken? I’ve read you can cook them with your broth to add more flavor. I hate wasting a part of the chicken, but I’m not sure what to do with them. I Kristin! I’m new on your blog. I really like your work. In my family we eat bones and skin of the chicken! So it will be very difficult to try your chicken broth. I tried your home made yogurt: it was very good. Hey Icia, I’m so glad you’re enjoying the blog, and the yogurt :). Maybe you could make vegetable broth? Hey Amy, I’ve found that cooking the broth for a long time can sometimes darken the color. Also, using onions, particularly with the skin on, will also result in brown broth. I have heard that you can add turmeric to the broth. It changes the color to a more golden color, for one thing. Also I have been using my new Inst Pot for making broth. It ways to cook on broth setting for 2 hrs. and then do the natural release. Ummm it’s been very good and the chkn. bones will smash between your fingers, they’re so soft. I prefer to use 1/4 C. ACV due to the fact that what I’ve read makes such a big deal of it. Pulls the minerals out of the bones and I sure DO want that. Enjoy! Such great tips, Renee! Thank you for sharing! Can you tell me why you throw away the veggies? It seems like they could be put in a food processor, or pureed, then used in soup, as a thickener, or spread on pizza or something like that. Hey Dixie, After cooking them on high for so long, there’s really nothing left of the veggies (meaning nutrients, taste, and they’re very limp and have lost a lot of color)–similar to steaming veggies for a few minutes. You could try blending them and see how they taste. I only got about 7ish cups of broth from this recipe, i’m assuming my crock pot is smaller than the one you used, should i dilute my broth before storing it? Hey Jennifer, I wouldn’t decrease it, unless you feel the flavor is too strong.